There are several frequent buyer programs out there, but the one that stands out is Astro Loyalty a frequent buyer program dedicated to helping independent pet retailers grow their business. They offer you an integrated, real-time platform that can transform traditional punch cards, paper forms, and files into a digital point-of-sale system that can be accessed online or through the Astro app. This makes having a frequent buyer program easier for you and also easier for your customers. Astro Loyalty helps you process frequent buyer rewards and offers you special deals from manufacturers along with marketing tools that come free with a subscription to Astro Loyalty. Sound too good to be true? It's not! Check out this great video that shows you just how easy Astro Loyalty is to use for your business. This quick overview of the Astro Loyalty shows just how easy it can be to automate the frequent buyer process.As an independent pet retailer, you have a lot on your plate and it can be difficult to take on more work even when it is to the benefit of your business and customers. Astro Loyalty is an easy way to bring added value to your customer’s experience in your store in a cost-effective manner. Let's take a look at some of Astro's best features. To get started all you need is a subscription to Astro and a tablet at your register so customers can easily sign up while at checkout. From there all it takes is a quick scan and Astro can keep track of purchases and automatically apply rewards. Data is sent to your distributor partner immediately and your coupon redemption time is therefore cut in half. This graphic shows just how simple Astro Loyalty makes having a frequent buyer program in your store. If that wasn’t good enough, Astro Loyalty is exclusively offered to the independent pet retailer. That means you are able to offer a great deal to your customers that they can’t get at your big box competitors while also making your job easier. Astro Loyalty can also be integrated with several popular POS systems such as Lightspeed, Retail Pro, and most recently NCR Counterpoint. Astro has partnered with Soft Intelligence who a offers Pet Rewards POS module that works with the NCR Counterpoint POS system which makes it perfect for the independent pet retailer. Astro Loyalty and Soft Intelligence share the common goal of wanting to help independent pet retailers beat their big box competitors through building customer loyalty and they have made it even easier through this integration. You can enrich your own loyalty program by pairing it with Astro Offers. These exclusive deals provided by Astro can get your customers great discounts on some of their favorite brands. You can also utilize the data gathered to send out your own e-blasts and segment customers to better target your email marketing messages. As always you can share your frequent buyer offers on social media as well. This can be a great opportunity to get more customers to join Astro Loyalty and to get customers who have already joined back in your store. 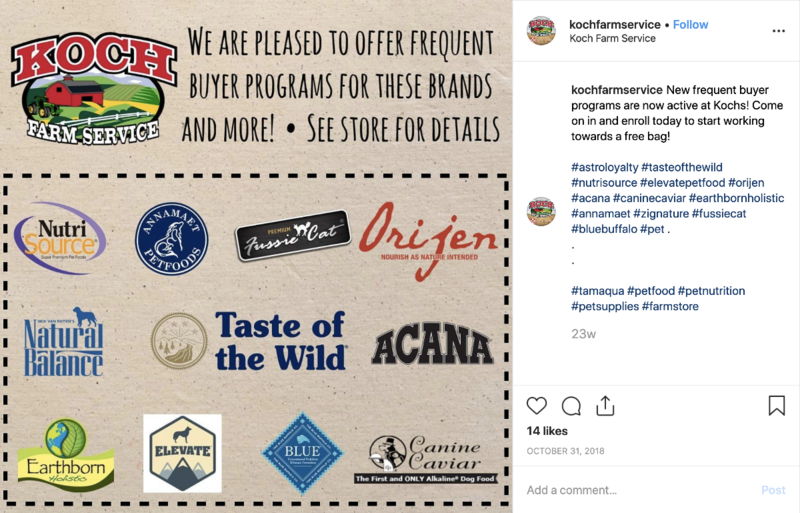 Koch Farm Service in Tamaqua, PA shared this post with their customers featuring all the brands available through their Astro Loyalty program. If you are not sure where to start when it comes to marketing the products you carry in your store Astro provides you with the tools for success. Astro Tools is free with a subscription to the Astro Loyalty program and offers several ways to connect with your customers anytime. 1. Send branded emails to your Astro Loyalty members to inform them of new deals or send reminder emails letting them know what rewards they are eligible for. Astro allows you to schedule emails ahead of time and also view the open rate and click through rate after sending.